Strange things happen everywhere but Hollywood is one of those places more prone to odd occurrences than most. Maybe it's something in the air or the water but most likely, it's due to the fact that Hollywood is a place that attracts people in larger numbers than most. 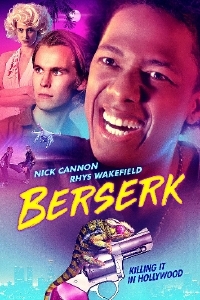 Written, directed and starring Rhys Wakefield who is best known for his turns in "True Detective" and as the creepy leader of the roving mob in The Purge, Berserk stars Wakefield as Evan, an aspiring actor/screenwriter who loses his current acting gig and his manager both in the opening scene of the movie. He pleads, unsuccessfully, for a second chance but his former manager leaves the door open: bring her a finished script with Raffy (Nick Cannon), a bonafide Hollywood star who Evan just happens to be good friends with, signed on to star and she'll consider taking him back. Evan and Raffy's afternoon of hanging out starts off well enough with the pair going over scenes and re-writing Evan's script but as the afternoon turns to evening, the pair unwind with some drugs and the pleasantness quickly dissipates when Evan inadvertently kills an intruder which quickly snowballs into full-on chaos when a cop (James Roday of "Psych" fame) who may also be Raffy's stalker, shows up to investigate a 911 call, followed by Raffy's friend Jazz (Nora Arnezeder) who turns up at the most inopportune time to save the day - sort of. While Berserk is clearly an attempt to say something about the strangeness of Hollywood and how everyone is pretending to be someone they're not, the theme is crudely slapped onto what is essentially a stoner-comedy-gone-wrong. As a stoner comedy, it definitely works. Cannon and Wakefield are adequately paranoid and the situations the pair find themselves in are inherently funny and made that much more amusing by the fact that they're high and generally misreading pretty much every action. The movie's single location is used to great effect by cinematographer Mac Fisken who infuses some of the scenes with a neon glow that plays into Berserk's setting and theme but it's really about the laughs and the characters move through the scenes in some pretty amusing ways. Berserk isn't exactly laugh-out-loud funny and the infusion of heftier ideas don't always work but Wakefield makes great use of the limited production to deliver an entertaining feature debut. Berserk opens in limited theatrical release and is available on VOD on April 5.